So far in this series we have examined the lives of several historical figures who have attempted either to maintain the Roman Empire or to recover elements of the fallen empire in the West. Of the latter, some have succeeded more than others in emulating aspects of the empire territorially and/or in seeking to defend and extend Constantine’s Christian heritage. But to whatever degree they have succeeded, all have failed in reestablishing the “glories of ancient Rome” for long. And despite the apparent attachment of some to Christianity, they have all usurped the role of messiah and identified with the pagan divinity cults of ancient Roman times. No one could lay claim to being more thoroughly European than the holy Roman emperor Charles V (1519–56). He was Spanish, Portuguese, French-Burgundian, Austrian and Netherlander, and he also had Bourbon and Plantagenet blood in him. He is said to have had ancestors who were German, Greek, Italian, Slav, Lithuanian, Bohemian, Scandinavian, Anglo-Saxon, Spanish Muslim and Jew. He spoke Spanish, French, Dutch, Italian and German fluently and acquired more than 70 royal, princely and other official titles, among them elected king of Germany, archduke of Austria, duke of Burgundy, and king of Castile and Aragon. By extension he had ruling rights in Bohemia, Hungary, Italy, Sicily, Sardinia, the Netherlands and the New World of the Americas, as well as claims to territories in Croatia and elsewhere. And Charles’s royal ties were even more impressive when extended family relationships are considered. Historian H.G. Koenigsberger notes that “at one time or another during his reign, Charles himself or a member of his family sat as ruler or consort on nearly every royal throne of Europe” (“The Empire of Charles V in Europe,” in Volume 2 of The New Cambridge Modern History, 1958). The geographic spread of his lands and family members and the responsibilities he accepted were the reason for his almost constant travels to the various parts of his empire and beyond. Charles’s territorial possessions amounted to the largest of any European power between 400 and 1800, stretching from Peru in the west to the Philippines in the east. It was truly an empire on which the sun never set. Charles was born in the Flanders city of Ghent in 1500 but was soon practically orphaned. His father, Philip the Handsome, son of Emperor Maximilian I, died in 1506; and his mother, Joanna, the mentally disturbed daughter of Ferdinand II and Isabella I “the Catholic” of Spain, spent most of her life in seclusion. Charles was brought up in Flanders by one of his godmothers, his aunt Margaret of Austria. As a young child, the prince was received into the Order of the Golden Fleece, a Burgundian institution founded in 1430 to give the ruling aristocracy opportunities for knightly valor in defense of land and religion. The induction would have coincided with the wishes of the man who became a father figure to Charles from the age of nine, William of Croy, Lord of Chièvres. He encouraged the young prince in the Burgundian cult of chivalry, with its Catholic Christian missionary ideals. Another major influence in Charles’s life was Adrian of Utrecht, appointed his tutor in 1506. A carpenter’s son, Adrian had become a scholastic theologian and professor among whose students was the Dutch Bible translator Erasmus (who for a time was also an advisor to the young Charles). Adrian eventually became a bishop and a Spanish grand inquisitor and continued as Charles’s spiritual counsel during the latter’s first years as king in Spain. With Charles’s assistance, he became Pope Adrian VI in 1522. On that occasion, records Flemish historian Wim Blockmans, the king wrote to him, “With the papacy in your hands and the Empire in mine I think that great things can be wrought through our unanimous actions. The love and obedience I bear you are no less than that of a good son towards his father” (Emperor Charles V: 1500–1558). In 1506, on his father Philip’s death, Charles had inherited Franche-Comté and the provinces that later came to be known as the Netherlands, as well as claim to the duchy of Burgundy (which had been seized by France in 1477). But because he was only six, his aunt Margaret was appointed as regent and served until 1515, when Charles was declared of age. Following the death in 1516 of his maternal grandfather, Ferdinand, Charles and his mother were declared the new “Catholic kings” of Spain. In 1517 he traveled to that country to claim his inheritance. However, his mother’s mental condition was such that, though they were corulers, Charles effectively became sole monarch. He was helped in the task by his grand chancellor, the brilliant Piedmontese lawyer Mercurino Arborio di Gattinara. Initially Charles's inability to speak Spanish as yet, together with his Flemish manners and his preference for Burgundian appointees, made him unpopular. In 1519 his paternal grandfather, Emperor Maximilian, died. Charles had been seeking election as his successor as holy Roman emperor, a process initiated on his behalf a year earlier by Maximilian himself. For now, Charles would have to leave Spain. In response to Spanish opposition to funding his imperial ambitions, Gattinara wrote a speech defending the need to travel to Germany, which the king delivered to the Spanish parliament in 1520. Blockmans quotes part of Charles’s speech: “This decision had to be made out of respect for the faith whose enemies have become so powerful that the peace of the commonwealth, the honor of Spain and the prosperity of my kingdoms can no longer tolerate such a threat. Their continued existence can only be assured if I unite Spain to Germany and the title of Caesar to that of King of Spain.” He then left Spain for three years. The pursuit of the imperial title brought Charles into competition with the French king, Francis I, who also sought the office. Even Henry VIII of England (whose wife at the time was Charles’s aunt Catherine of Aragon) considered entering the race. German historian Gertrude von Schwarzenfeld writes that each monarch’s attraction to the imperial throne “shows how, in the age of humanism, the super-national character of the imperial idea was once more admitted. With the rediscovery of antiquity men remembered the old Roman Empire.” The Renaissance was based in part on this return to the values of Greece and Rome, and its associated humanist agenda was supportive of pan-European unity. Bankrolled by various great European capitalist families, Charles was able to outbribe Francis with the electors. Despite what appears to have been a late attempt on Pope Leo X’s part to promote the Duke of Saxony, Charles’s appointment by unanimous vote as Roman king and emperor elect of the Holy Roman Empire on June 28, 1519, put a potential revival of Roman ideals into the hands of the Habsburgs. Biographer Karl Brandi records what Gattinara wrote to the new emperor on his election: “Sire, God has been very merciful to you: he has raised you above all the Kings and princes of Christendom to a power such as no sovereign has enjoyed since your ancestor Charles the Great [Charlemagne]. He has set you on the way towards a world monarchy, towards the uniting of all Christendom under a single shepherd” (The Emperor Charles V, 1939). In October 1520, in keeping with the traditions of the Holy Roman Empire, Charles was crowned Roman king in Charlemagne’s capital of Aachen. At the beginning of the ceremony, records historian Friedrich Heer, Charles kissed the cross of the Empire, which dated from the time of Charlemagne’s grandson Lothar (840–55). Significantly, the crucifix was inlaid with a cameo of Caesar Augustus on one side and Christ on the other. Before the altar, Charles prostrated himself and swore to defend the Catholic faith, to protect the Church, to recover the possessions of the empire, to protect the weak and defenseless, and to submit to the pope and the Roman church. Once Charles had affirmed his intentions, the princes and representatives of the people were asked to acclaim him ruler in the Roman imperial tradition by raising their hands and shouting aloud. The electors handed Charles the sword of Charlemagne; the archbishops of Cologne and Trier anointed him, dressed him in Charlemagne’s coronation robes, and gave him the orb and scepter; and the archbishop of Cologne placed the imperial crown of Otto the Great on his head. Charles then sat on Charlemagne’s throne and took Communion. With a vast territory to rule and deep Roman Catholic convictions, Charles wanted peace to come. But his 37-year rule was affected by circumstances that made conflict inevitable. As the defender of Catholic Christianity, he wrestled for most of his tenure with the growing unrest unleashed by Martin Luther’s call for radical reform within the church. In addition, Charles’s enduring rivalry with Francis I of France over lost territories made conflict between the Habsburgs and the Valois a feature of most of his reign. To the east, the threat from the expansionist Ottoman Empire brought the emperor face-to-face with the Turks in the Mediterranean, Italy and eastern Europe. Both theaters of conflict were made more challenging and costly by expensive advances in warfare. And while Spain’s recently acquired access to the gold and silver mines of Central and South America ought to have given Charles an edge, his obligatory travels and his sometimes unnecessary campaigns put him in continual financial jeopardy. When the emperor-elect attended the diet meeting in Worms in 1521, he was one of two men with the same goal of religious reform (though by very different methods), who met for the first time. Charles, who according to Heer described himself to the assembly as descended from “the christian emperors of the noble German nation, from the Catholic kings of Spain, from the archdukes of Austria, from the dukes of Burgundy, all of whom remained until death the faithful sons of the Roman Church and constant defenders of the Catholic faith,” was just 21. His counterpart was the 37-year-old Augustinian monk and professor of theology at Wittenberg University, Martin Luther. Four years earlier he had put forward his 95 theses expressing doctrinal and ecclesiastical propositions, which ran counter to the rule of the Vatican. Disagreement with Rome was not new in Germany. For a hundred years, church officials had objected to papal interference in their affairs. But with the flowering of dissent in what became the Spanish Netherlands (corresponding roughly to Belgium and Luxembourg today), Pope Leo X had decreed through the Fifth Lateran Council in 1515 that printed materials could spread heresy and must henceforth be approved by the church. In response, records Blockmans, Charles issued three edicts—in 1517, 1519 and 1520. Of great concern to him were Luther’s own widely circulated works and his anti-papal behavior: he had publicly burned the pope’s letter of excommunication and a copy of church law. Blockmans notes that in March 1521, referring to himself as the “greatest protector and upholder of the Universal Church,” Charles commanded that heretical works be burned in public places of punishment to the sound of trumpets. The emperor was determined to deal with the growing threat to law and order and commanded Luther to attend the meeting in Worms. At the diet Luther refused to recant (“popes and councils are not credible because they are known often to have erred and contradicted themselves”). The resulting Edict of Worms condemned possession or even reading of Luther’s works and again required their public burning. But because the emperor adhered to the Burgundian code of chivalry, he had guaranteed Luther safe conduct to and from the diet. In Germany, the Peasants’ War (1524–26) over social and economic inequalities was a direct outcome of the unrest brought about by Luther’s actions, though he himself condemned the perpetrators. Koenigsberger remarks that Gattinara, the Roman lawyer, not only viewed Charles as a new Charlemagne but also referred to him as “following the path of the good emperor Justinian”—no doubt in the hope that Charles would similarly reform law and simplify legal process. That way “it would be possible to say that there was one emperor and one universal law.” Gattinara believed that Charles’s imperial title was “ordained by God himself . . . and approved by the birth, life and death of our Redeemer Christ.” The language was consistent with his philosophy. As Charles’s political tutor and personal advisor, Gattinara promoted the Roman-Italian-imperial ideology of the proto-Renaissance writer Dante Alighieri, who viewed Italy as the essential center of imperial power. This created a significant context for Charles’s accession to the imperial throne. From 1522 to 1529 Charles made Spain his home for the first time. It was from Barcelona in late July 1529 that he began his journey to Italy for his imperial coronation by Pope Clement VII. Relations with the papacy had been severely disrupted in 1527, when to Charles’s great embarrassment his commanders lost control of his underpaid troops and they sacked Rome, proceeding then to hold the pope prisoner for seven months. Now, in an effort to placate Italian sensibilities and regain popularity, Charles adopted a new image. Following the advice of Gattinara, he refashioned himself as the incarnation of a Roman emperor. His chancellor was not the only one to give such counsel. In 1529, Charles’s court chaplain, Antonio de Guevara, wrote a political treatise on the second-century Roman emperor Marcus Aurelius (161–180), recommending him as a model for his master. It seems that Italy was as ready for an emperor as Charles was to become one officially. The time had come to impress his status on the public in a new way: “the imperial entry”—triumphal processions, in ancient Roman style, through the empire’s towns and cities—was introduced. When Charles’s ships arrived in the harbor of Genoa, not only did he look Roman, but he was greeted by a reconstruction of an ancient Roman triumphal arch embellished with the Habsburg double-headed eagle. Another copy of a triumphal arch adorned the cathedral. When the emperor-elect entered Bologna for the coronation, the procession passed by portraits of Caesar, Augustus, Titus and Trajan, placed side by side with his own insignia. Not only was Charles successor of Roman emperors but also defender of the faith and soldier of God in the tradition of Charlemagne’s restored empire of 800. Following medieval precedent, on February 22, 1530, the pope placed the iron crown of Lombardy on Charles’s head. Two days later he installed him as emperor—the last time a holy Roman emperor would be crowned by a pope, though the empire was to survive for almost another 300 years. On his way to Germany in June, Charles stayed at Innsbruck. It was there that Gattinara died. The unity of the empire for which the chancellor had worked long and hard lost its catalyst. Though he was now mature, Charles was deprived of his most imperially minded advisor and appointed two less powerful secretaries of state to take his place. But as we will see, Charles never gave up on the religious and imperial ideals encouraged in his formative years by Erasmus, Gattinara, Guevara and others. In 1536 he entered Rome in triumph as one of his forebears of old had done, riding along the ancient Via Triumphalis on a white horse and clad in a purple cape. According to art historian Yona Pinson, “Charles had re-established himself as the legitimate successor to the Roman Empire” in the image of Marcus Aurelius, as a conqueror mounted on a horse (“Imperial Ideology in the Triumphal Entry into Lille of Charles V and the Crown Prince ,” in Volume 6 of Assaph Studies in Art History, 2001). A continuing preoccupation of Charles’s reign following Gattinara’s death was the growing Protestant revolt. Though the emperor’s attention was often diverted by the French and Turkish threats—reason enough to avoid the widening religious and political split within Germany—both Charles and the Protestants were frustrated in their attempts to get the papacy to address reconciliation through reform. The emperor tried to persuade the Vatican to authorize a council to discuss all matters relating to German ecclesiastical complaints, but as Heer remarks, “Charles V, the most Catholic emperor the world has ever seen, found in the popes his most formidable adversaries.” And although Charles himself was never inclined to doctrinal change, his counterparts were never inclined to settle matters without it. From June through September 1530, Charles presided over the fractious Diet of Augsburg, where the statement that became the doctrinal basis of all Protestant groups, the Confession of Augsburg, was first read. Thus Charles’s attempt at forging reconciliation inadvertently produced the foundational document of the Protestant rift with Rome. Titian’s celebratory painting of the emperor’s victory shows him once more on horseback, carrying the highly symbolic Carolingian Holy Lance, which contained what were believed to be parts of reliquary nails from Christ’s crucifixion: the defender of the Catholic faith had triumphed with his Savior’s help. Titian’s portrait was more propagandistic than realistic, however, as Charles had actually carried a very different, short spear into the battle. His victory at Mühlberg notwithstanding, Charles was not of a mind to crush Protestantism. He knew that he could never succeed. Thus, in 1555, the Peace of Augsburg gave imperial recognition to the Confession of Augsburg, providing freedom of religion to German princes and their territories and to free cities. By the end of the century, 37 years after the final meeting of the Council of Trent, most of the abuses that had brought about the Protestant Reformation had been overcome, but by then doctrinal differences were entrenched and Europe would no longer be united by Catholicism. The Council had also signaled the beginning of the Counter-Reformation, through which the Catholic Church seized the initiative and instituted the Holy Office of the Inquisition. The cruel suppression of those who accepted contrary doctrine not sanctioned by their prince could only heighten the division between German Catholics and Protestants, which eventually erupted in the Thirty Years’ War (1618–48). What Charles had sought to avoid by discussion and reconciliation—violent disunity in Christendom—became the next century’s hallmark. In 1548 Charles’s pursuit of dynasty and empire was mirrored in a new series of imperial entries into major cities, beginning once more in Genoa and concluding in Antwerp a year later. The purpose of these processions was to introduce Philip, Charles’s only legitimate son and heir, to his future subjects in the context of imperial ideology. Typically the entries were decorated by triumphal arches in Roman style, and with various floats and tableaux vivants (living pictures) illustrating scenes from the emperor’s successful rule. According to Pinson, Charles and Philip’s 1549 entry into Lille in northern France was particularly impressive in a politico-religious sense, demonstrating “militantly Catholic propaganda.” The “image of the ideal emperor” was on display as “Charlemagne’s true heir and successor, Defender of the Church and the Faith,” fused with “Caesar as the ruler of the world (Domine Mundi).” Charles’s military victories over enemies within and without the empire were celebrated in the elaborate decorations, with overt references to ancient Roman conquerors as well as to classical pagan and biblical themes. By association Charles was Titus, defeating the anti-Christian Jews and destroying Jerusalem and its temple in 70 C.E. He was “a Christian savior accompanied by Mars and Neptune on the one hand and by theological virtues on the other.” He was also the biblical Gideon, destroyer of the pagan altar of Baal in the time of the Judges and possessor of the miraculous woolen fleece (this biblical reference was conflated with Charles’s patronage of the chivalric Order of the Golden Fleece). All of the processions depicted and celebrated the idea of succession from father to son: Abraham and Isaac; David and Solomon; Philip of Macedon and Alexander the Great; Vespasian and Titus. In each of the imperial entries, Charles’s mantle was falling on Philip the faithful son. The task of ruling an empire on which the sun never set, with a mindset no longer appropriate to the war-torn and religiously fragmented times, brought a weary Charles to the point of abdication. In 1555 he resigned from his responsibilities in the Netherlands and in 1556 also assigned Spain to Philip. That same year he decided that his brother Ferdinand I should be offered the imperial crown. Ferdinand became emperor two years after Charles retired to a Spanish monastery, San Jerónimo de Yuste in Extremadura, where he lived as a private citizen until his death on September 21, 1558. In his political testament to his son, Charles urged Philip to strive for peace but not to fully renounce his right to Burgundy, “our fatherland.” As we have seen previously, Burgundy comprised part of the “Middle Kingdom”—the same remnants of the western Roman Empire that consumed Otto the Great’s energies following the collapse of Charlemagne’s realm—and became instrumental in various attempts to restore Rome’s centripetal power. Gradually over the next two centuries the center of gravity shifted westward, but not as Charles had hoped. It was the Atlantic nations of France, Britain and America that now extended their power internationally. As a consequence, the Holy Roman Empire became less and less influential, its emperorship more and more ceremonial—that was, until the rise of Napoleon Bonaparte, whose aspirations to become the new Charlemagne operating from French soil brought him face-to-face with the final Habsburg holy Roman emperor, Francis II. We take up Napoleon’s attempt at empire next time in Part 6. 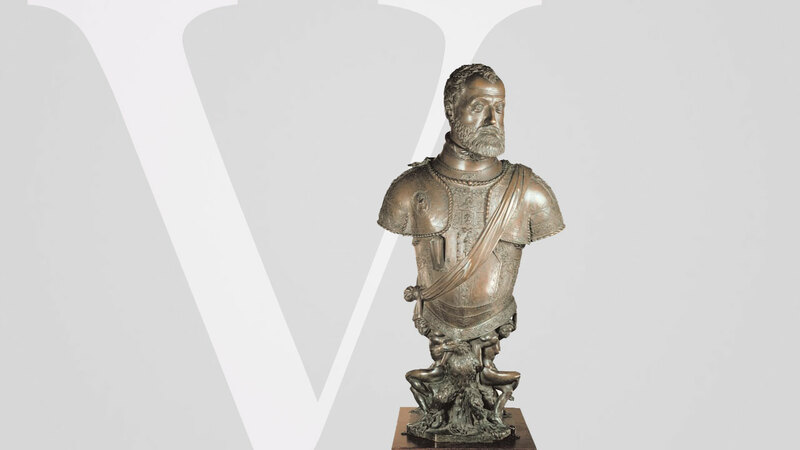 Wim Blockmans, Emperor Charles V: 1500–1558, trans. by Isola van den Hoven-Vardon (2002). Karl Brandi, The Emperor Charles V: The Growth and Destiny of a Man and of a World Empire, trans. by C.V. Wedgwood (1939). Friedrich Heer, The Holy Roman Empire, trans. by Janet Sondheimer (1968). Gertrude von Schwarzenfeld, Charles V: Father of Europe, trans. by Ruth Mary Bethell (1957).